This Wednesday marks the one-year anniversary of the publication of The Flavor Bible, a book that should hold a prominent place in any curious cook’s library. I’ve previously mentioned it here and here. Recipes are lovely, and I can’t possible buy or read enough traditional cookbooks in this lifetime. But there is another side to cooking that I think is just as important for cooks, especially home cooks, to explore. It’s the improvisational side. The process that starts with a blank slate of a clean kitchen and comes to life with one or two ingredients - something that looked particularly good at the store that week, a memory of a favorite dish, a scene from a movie, a song, a mood. To make something edible out of this process, it’s important to have a basic grasp of cooking fundamentals - how to saute, how to poach, how to steam, how to broil, etc. But it’s also critically important to have a way to get your hungry head around the flavors before you begin, lest you waste perfectly good chocolate chip cookies by sullying them with mint (hypothetically, of course). Authors Karen Page and Andrew Dornenburg help guide this process by providing (though what can only have been a Herculean effort) an index of ingredients and the flavors that best compliment them. 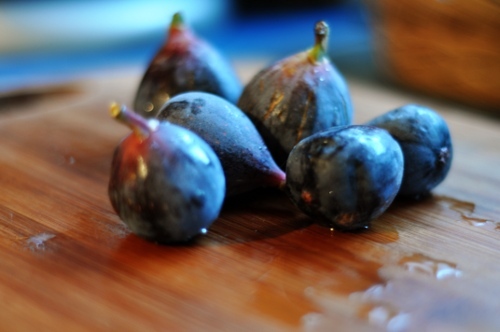 Need a hand figuring out what to do with the basket of figs that called out to you at the farmers’ market? Turn to page 162 and see the 70+ flavors that will best compliment them (personal favorite: goat cheese). My own improvisational process has benefited greatly from The Flavor Bible, and I’m happy to help Page and Dornenburg celebrate the anniversary of this wonderful text. hmm I will definitely have to look into that book, it sounds awesome! By the way, I just read through your entire blog (yes, every post). It’s amazing! The food you make sounds soo good, but also your writing is fantastic - really a pleasure to read through. Nice job! Hey thanks! I’m glad to have you as a reader. Definitely check out The Flavor Bible - it’s such a valuable resource. My chilled carrot soup recipe is pretty much entirely based on ideas I grabbed from TFB. It’s a superb way to expand your knowledge base about what flavors pair well together. That and Ratio are my top two recommendations for anyone who wants to learn how to cook beyond recipes. Love that book! It’s helped me improvise dishes with confidence all summer long. In fact, I almost don’t want to admit that I own it, preferring instead to pretend that my improvisations are merely the result of my unique genius. The authors’ other book, What to Drink with What You Eat, has been similarly useful. I’ve always been a wine snob but that book has taken my pairings to a whole new level. What to Drink with What You Eat is on my short list of upcoming book purchases - I’m not terribly confident in my pairing abilities at the moment. I’m so impressed with The Flavor Bible that I’m really looking forward to exploring some of the authors’ other work. Hows and Whys, IMBO, Ingredients, What's this cooking stuff all about? The Salty Spoon is powered by	WordPress 2.7 and delivered to you in 0.241 seconds using 24 queries.